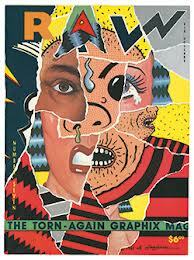 Art Spiegelman’s Comics Celebrated with Museum Retrospective : COMICS ARE EVERYWHERE! Art Spiegelman's museum retrospective looks at over 30 years of the prolific artist's insightful and innovative comics and illustrations. There is no question that comics creator Art Spiegelman has done more than anyone to raise the bar of what comics can do as a serious, artistic medium on par with literature and the other visual arts. So, it comes as no surprise that the Centre Pompidou in Paris is among the international arts institutions honoring the artist’s prolific body of work with the traveling exhibition, Art Spiegelman: Co-Mix, A Retrospective of Comics, Graphics and Scraps currently on display at the Vancouver Art Gallery through June. The show will eventually makes its way to the Big Apple when it is shown at New York’s Jewish Museum in Fall 2013. In tandem with the exhibition looking at over 30 years of the artist’s work, Drawn & Quarterly is publishing the English language edition of the show’s accompanying book in Spring 2013. Art Spiegelman's book Meta Maus looks at the origins and impact of his groundbreaking comic. Of course, Spiegelman’s greatest and best-known work is his Pulitzer Prize-winning graphic novel Maus, which chronicles his father’s traumatic experiences during the Holocaust. 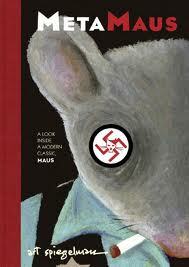 However, what separates Maus from other books on this massive subject is how Spiegelman makes the catastrophic horrors of the Nazis’ Final Solution feel new for contemporary readers through the approach of using anthropomorphic characters to tell his father’s story. In the claustrophobic panels of Spiegalman’s unique comic, the Jews are rendered as mice and their Nazi oppressors are depicted as cats in an endgame that pushes the envelope of this stylistic device not unlike George Orwell’s classic novel Animal Farm. Whether one is a first-time reader of Maus or a veteran comic-book enthusiast revisiting this classic comic, the volume’s impact is always a harrowing experience. The book’s stark, black-and-white drawings are deceptively simple, showing just enough select details to make us feel empathy for the characters’ plight. The fusion of artwork juxtaposed with words packs an accumulative punch in what Spiegelman once described to me as “picture writing” during an interview in the 1990s. When I taught my Comics and Graphic Narrative course at San Diego State University’s Department of English and Comparative Literature, I always included Maus as one of the essential works in comics. And my students dived into the pages of Spiegelman’s visual labyrinth, devouring the story and always having something engaging about this book that is often taught in colleges and universities across the nation and abroad. Likewise, Spiegelman’s museum retrospective will allow viewers to see the artist’s evolution and artistic growth through his other works as well. After all, Spiegelman also had an indelible influence with the underground comic anthology Raw, which he published in collaboration with his wife Francoise Mouly during the 1980s. Art Spiegelman and his wife Francoise Mouly assembled an impressive lineup of innovative comics creators whose works found a home in the pages of the underground comix magazine, RAW. I look forward to, hopefully, making the trek to New York to see this show in person when it opens at Jewish Museum next fall. And if good fortune smiles on me, perhaps, I might be able to convince Spiegelman to appear on camera in my documentary, Comics Are Everywhere where his insights into why comics remain a relevant and often misunderstood medium would be much appreciated. Of course, I write this statement with my fingers crossed, hoping that such opportunity can be arranged. After all, my first encounter with Spiegelman was a wonderful experience and the interview was more of a conversation between artists than a traditional interview. When I published the article in The San Diego Union-Tribune, I sent a copy to his New York studio. Spiegelman was kind enough to write me back to say he liked the piece. 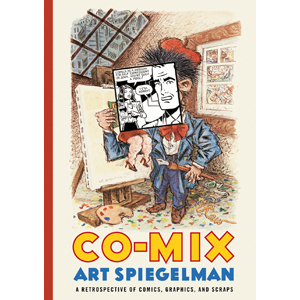 Spiegelman’s comics continue to throw a harsh, unblinking light on contemporary issues and concerns as the artist uses his self-described “picture writing” skills to bite the hand that feeds him and disturb the peace the way that all great art should. Art can arrive in simple packages and Spiegelman’s comics are never short of surprises.